Loyal H. “Bud” Chapman, a native of Minnesota, was born in 1923. He began painting at an early age and played his first round of golf as a caddie at the age of 12 at Interlachen Country Club, the site where Bobby Jones finalized his grand slam. 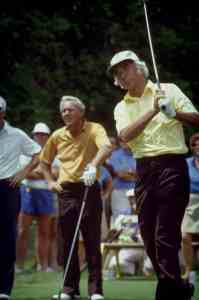 As a youngster, he caddied for legendary golfer Patty Berg. 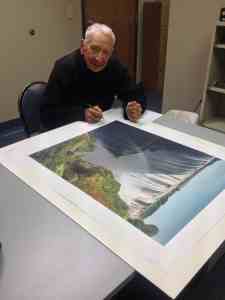 During World War II he flew B-29’s, and following the war he attended Walker Art School in Minneapolis. 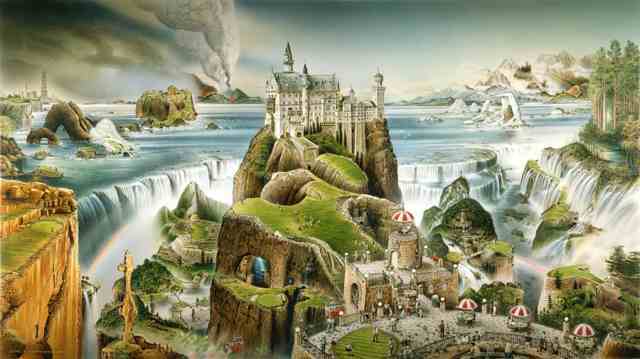 He later opened his own art studio, starting a career as a commercial artist. 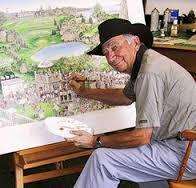 In 1972 he completed his first golf painting, Victoria Falls Golf Club. Seventeen more holes followed over the next 10 years that were to be the 18 Infamous Golf Holes. To climax and complete the series he created the 19th Infamous Hole Golf Course. This whimsical golf art series first appeared in Golf Digest Magazine and later were featured internationally in Reader’s Digest Magazine. They have appeared and been featured on numerous television talk shows and have been distributed throughout the world. An avid golfer, Bud Chapman has won several state tournaments, was perennial club champion and participated in USGA national amateur opens, and has also been inducted into the Minnesota Golf Hall of Fame. At the age of 91 he still carries a 4.2 handicap and still continues to paint.